Samsung urges you to “Get your TV to show the family what really matters, when it matters”, in a series of new ads promoting the Family Hub. Titled “Intelligent Life by Samsung,” the series is aimed at showing that you can connect your Samsung devices in your home and simply ask Bixby to do a specific task so that you could have more time for life. One of the spots features a mother telling her little daughter to clean up the mess she made on the kitchen table before she goes watching her show on TV. “Ok, I got this!” the kid says and then asks Bixby to start auto cleaning. At this point, the family’s robot vacuum is turned on and “sent” to clean the floor. “Connect the fridge and robot vacuum for more of life” an onscreen line reads at the end of the spot, which also sees the hashtag #DoWhatYouCant. The girl’s voice is heard saying “Life just gets better and better”. Another spot part of the same series shows you how to make your dog move. 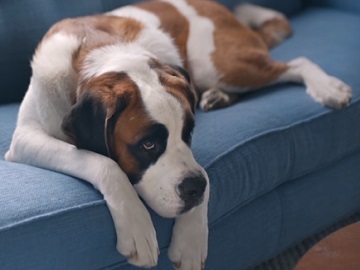 The video features a Saint Bernard laying on the couch and watching a dog show on TV. When his owner asks him to join her for a walk, he doesn’t move. The same happens when the woman calls him by his entire name, Augustus Jonathan Parker the 3rd. Thus, she comes up with the idea to ask Bixby to show on TV the inside of the fridge in order to make her furry friend move. At this point, “Auggie” jumps off the couch, barking and willing to move. “Connect the fridge and TV for more of life” an onscreen line reads at the end of the spot. The tech giant is now working to create an IoT (Internet of Things) ecosystem in which all its devices, from mobile devices and TVs to sensors and home appliances, can interact smoothly. Based on a unified, powerful cloud that will be accessible through a single SmartThings app and using the intelligent assistant Bixby 2.0 to connect all devices inside and outside of the home, this ecosystem is set to connect approximately 200 million Samsung devices by the end of this year and all Samsung devices by 2020.